KW Landscaping is currently in the process of renewing all of our landscape management agreements for our clients. 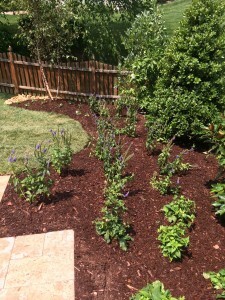 The services vary depending on the individual client’s desires and needs however, the application of organic mulch is an important service to consider adding to your annual agreement. The best time-saving measure a gardener can take is applying mulch. This goes for every garden site, from vegetable gardens to flower beds and, in the fall, I even suggest mulching your lawn with compost. Mulched gardens are healthier, more weed free, and more drought-resistant then unmulched gardens, so you’ll spend less time watering, weeding, and fighting pest problems. There are two basic kinds of mulch: organic and inorganic. Organic mulches include formerly living material such as chopped leaves, straw, grass clippings, compost, wood chips, shredded bark, sawdust, pine needles, and even paper. 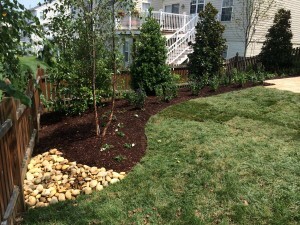 Inorganic mulches include gravel, stones, black plastic, and geotextiles (landscape fabrics). Both types discourage weeds, but organic mulches also improve the soil as they decompose adding beneficial nutrients. Inorganic mulches don’t break down and enrich the soil, but under certain circumstances they’re the mulch of choice. For example, black plastic warms the soil and radiates heat during the night, keeping heat-loving vegetables such as eggplant and tomatoes cozy and vigorous. There are two cardinal rules for using organic mulches to combat weeds. First, be sure to lay the mulch down on soil that is already weeded. Secondly, lay down a thick enough layer to discourage new weeds from coming up through it, but do not spread the mulch too thick around plants as that will cause other issues. 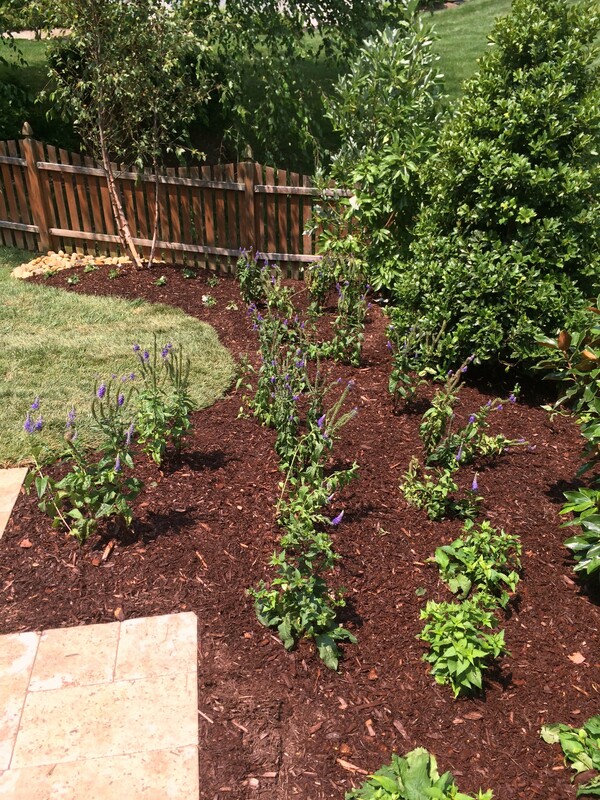 Wood chips and bark mulch are the most common mulches. You can purchase bags of decorative wood chips or shredded bark from a local garden center to mulch your flower garden and shrub borders. A more inexpensive source of wood chips might be your tree-care company or the utility company. They may be willing to sell you a truckload of chips at a nominal price. Many community yard waste collection sites offer chipped yard debris or composted grass clippings and fall leaves to residents for free (or for a small fee). Shredded leaves are great for woodland gardens. If you have trees on your property, shredding the fallen leaves creates a nutrient-rich mulch for free. You can use a leaf-shredding machine, but you don’t really need a special machine to shred leaves—a lawn mower with a bagger will collect leaves and cut them into the perfect size for mulching. Please beware of using wood chips and brush dump mulches. These two can be full of plant pathogens or insect infestations. Trees and bushes often die because of a insects or diseases. When these are chipped up or ground into shredded mulch, the issues do not go away. Composting this material will not get rid of these issues either. If you use these chips or mulches, you may just introduce a huge problem into your landscape. Ask what the source of the mulch is before you buy and avoid brush dump mulches. My strong suggestion to get a quality product is to purchase bagged mulch, it is much easier and faster to spread as well. Grass clippings are another readily available mulch, although it’s a great idea to return at least some of your grass clippings directly to the lawn as a natural fertilizer. It’s fine to collect grass clippings occasionally to use as mulch, and the nitrogen-rich clippings are an especially good choice for mulching vegetable gardens. Your vegetables will thank you for the nitrogen boost! But think twice about doing this trick if your lawn is chemically treated, those chemicals will make their way to the food you want to eat. If you have enough compost, it’s fine to use it as a mulch. It will definitely enrich your soil and make your plants happy, but keep in mind that when any kind of mulch is dry, it’s not a hospitable place for plant roots. So you may want to reserve your compost to spread as a thin layer around plants and top it with another mulch, such as chopped leaves. That way the compost will stay moist and biologically active, which will provide maximum benefit for your plants. Pine needles: Pine needles are a trim-looking mulch for garden beds. They allow water to pass through easily and they break down slowly. Despite what you may have heard, using pine-needle mulch will not make your soil significantly more acid. If you would like pine needles as your mulch, KW can source these and spread it as we do for a few clients. KW Landscaping’s mulch service includes an application of an Organic weed & feed and edging of the beds and trees. An Organically dyed BROWN cedar mulch will be used. The benefits of Cedar mulch include slower decomposition (allowing the mulch to last longer) and natural insect resistance. This service is typically performed in the Spring. Fall or an early Winter mulching is available upon request. This mulch is free of insects and diseases unlike local brush dump mulch used by others. Please email KW Landscaping with any questions you may have or to receive a quote for your home or business.